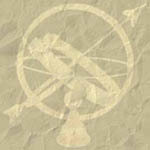 Our New Try-God.com Planisphere Poster! This tasteful and beautifully done full color glossy 18 x 24 Poster, is just what is needed by any amateur astronomer, student or for those interested in learning the celestial map with a view towards Biblical Astronomy. With the key ancient star names labelled within each Constellation, along with some of the ancient star pictures, this poster is truly a unique find today! As an artistic rendition of a 19th Century star map, The Try-God.com Planisphere will make a wonderful addition to your home, office, classroom or Church, as a decorative or study piece. For the beginner or the more advanced, this high quality poster is the perfect addition, whatever your need. This large 18 x 24 poster is available for $34.95 plus shipping and handling. We also have available for the first time, a new 11x17 color version of the poster which includes a legend defining the Bible symbolism of the 12 signs. This makes a great witnessing tool, and is yours for $14.95 plus S&H. What is pictured below is our unique First Edition, incorporating the star shaft alignments of the Great Pyramid to key constellations. Our initial product selections in the Try-God Book Shoppe include some exciting new items! 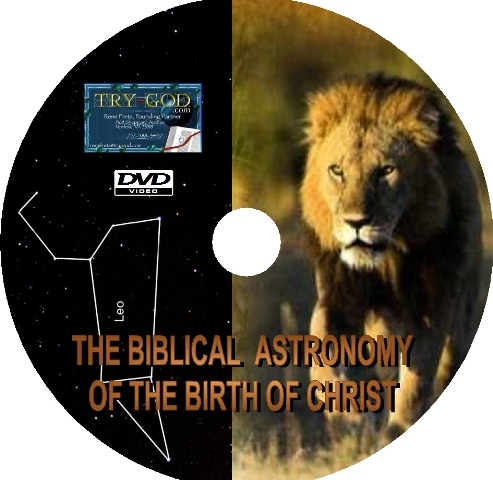 We are now offering our first DVD Edutainment piece on "The Biblical Astronomy of the Birth of Christ." [preview the intro on Youtube]. This is a 81 minute full-length multimedia presentation, providing a foundation from which many future presentations on Biblical Astronomy will launch. This DVD answers many questions that still plague this critical area of Biblical Astronomy, clearing up much of the confusion that lingers like a cloud over the birth of Christ. As we reveal the Biblical, Archaeo-astronomical, historical and celestial secrets of the Birth of Christ, we will see how the day, time and even hour of his birth is nailed down like never before. As we walk the trail of the intrepid Persian Magi through their 600 year historical trek that led them to Jerusalem, and ultimately to the Christ-child, you will see ages of tradition, myth and confusion dissipate before your eyes!! This unique presentation is yours for $19.95 USD, which includes shipping and handling in the lower 48 states.